The three arrows represent that the three girls were born and then at the age of choosing they were separated after they were told what their gifts were. The bench represent the three pillars of the highest factions that still stand as the top three fighting for the crown. This represents the poisoned food Katherine had to eat at the practice Gave Noir. I would like to read three stand-alone Lois Duncan books. 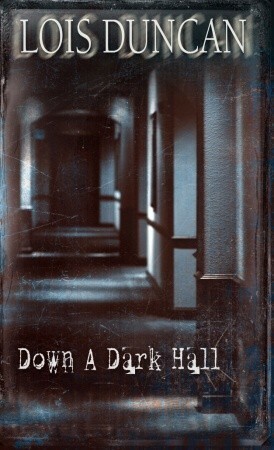 They are Down a Dark Hall, The Twisted Window, and Don’t Look Behind You. I want to read these as a new “series” final because I love reading scary mysterious books. I also saw them in the library this morning and was immediately drawn to them. I have neither read any of these books nor read any from Lois Duncan so I think it should be an interesting fresh new experience. I never thought I’d want to see the day when my fate became closely intertwined with my fathers’.. I never wanted to give him the satisfaction of knowing that I wanted to learn anymore about him than I already knew. My mother never told me much about him so I never cared. My name is Steelheart. That is all anyone need know. One person still lives that has ever seen me bleed. He’s the only person I could truly loathe. Until I met the Reckoners, that is; after Deathpoint decided to ruin the picture. It was a dreary Spring day in April, the day I was born. I was actually a lot like David was; born and raised in Newcago, kinda small, nerdy even, I’d even lost my a parent while I was young. As I got older I thought more and more about my father. Who was he, how did he actually die, why was I so fearful that I would end up dying before I even made it to the ripe old age of 34 when my father died? So many questions swam through my head. One day as I sat thinking about my father, I had a strange tingling feeling. This man, ugly as he was, had caught my attention along with many others, including my mother. She looked up at me yelling to get inside. I complied. Everyone had been talking about the new star that looked like a bloody sun that had just appeared along with a man who stood out way more than I think he would have liked. As the week went on I started to have headaches and a strange sensation to be rebellious. My mom thought it was a silly cold like always but I knew it had to do with that strange man who I had seen. Then Calamity hit. As soon as I knew I had powers, I used them. I couldn’t just stand by and watch as people were hurt. But only those who brought something to the table…and they had to be in my neighborhood….or else it would be too much work. I used to be neutral on how I felt about people in the city. Until I’d heard that another epic had decided to terrorize the bank that I normally roamed. As I neared the door and could hear the screams and pops of noise I decided things would be different. If you were going to come into MY city and hurt MY people, you had another thing coming. That’s when I became my true self. One where no one would be able to hurt me, or my mother and family ever again. And I would live to see my 34th year of life, and further beyond. At that moment I had a thin layer of steel cover my skin. I immediately acknowledged the fact that I was now not only just an epic, but a high epic. No one, not a single soul, mortal or immortal would live through my wrath by persecuting those already under my thumb. It was time to show Chicago the true supreme leader was. I cracked my knuckles and descended into the bank as the doors flew open and I settled on the ground in the doorway. Things were going to be different around here. I am Zoe S. I love reading whodunit and murder mystery books. My favorite one is called Relentless by Clair M. Poulson. He is an amazing writer who pulls you in until the very end. I seriously could read for days! All I need is a slot at the bottom of my door for food and drinks and I’m good to go. I have been an avid reader since I picked a book when I was in elementary school. I think it might have been a Junie B. Jones book although I might not want to admit that to Mrs. Roadhouse… Anyway, I wanted to take this class to have the ability to read new books that I may not ever have picked in the first place and find more authors to follow and love.